When I produce a song in Pro Tools I tend to reach for drum VI's instead of using a real drummer. I rely on the flexibility that drum VI's offer as I often adapt and develop drum sections throughout a production process, not just at the start. The drum groove and drum VI kit for a song are the first things I try to establish. Getting the right drum sound and groove early on in a production helps pave the way for the entire production journey and defines a song's attitude, dynamics and energy. I have more drum VI products than any other virtual instrument - there's not that many drum VIs I haven't tried. Now I'll admit, I was quite late to the Toontrack party - I only starting using Toontrack's EZ Drummer 2 this year (thank you to our friends at Time+Space for introducing me to EZ Drummer 2). I have been so impressed with the sound quality of EZ Drummer 2, especially some of the Expansion packs (named EZX for short) that I don't use any other drum VI other than the EZ Drummer products when I produce music. Listed below are three EZ Drummer 2 EZX Expansions that I absolutely adore. If like me you are a regular drum VI user then I strongly recommend you try some of these EZ Drummer 2 EZX pack for yourselves. If you are looking for a retro style drum pack with character, charm and punch then look no further than the EZX Traditional Country pack. The quality of the sample are deep and full of tone. Included alongside stick drum hits are a selection of brush samples that sound absolutely amazing in folk, pop and country productions. My favourite drum kit in EZX Traditional County is the Basic Apollo kit. The snare just cuts through everything in the mix while the kick just seems to always sit nicely under my bass guitar lines. All the kits in this pack sound very old school anolog, You can even hear the hiss of the vintage gear that was used to record the samples, this I feel adds an extra layer of vintage vibe to the whole package. 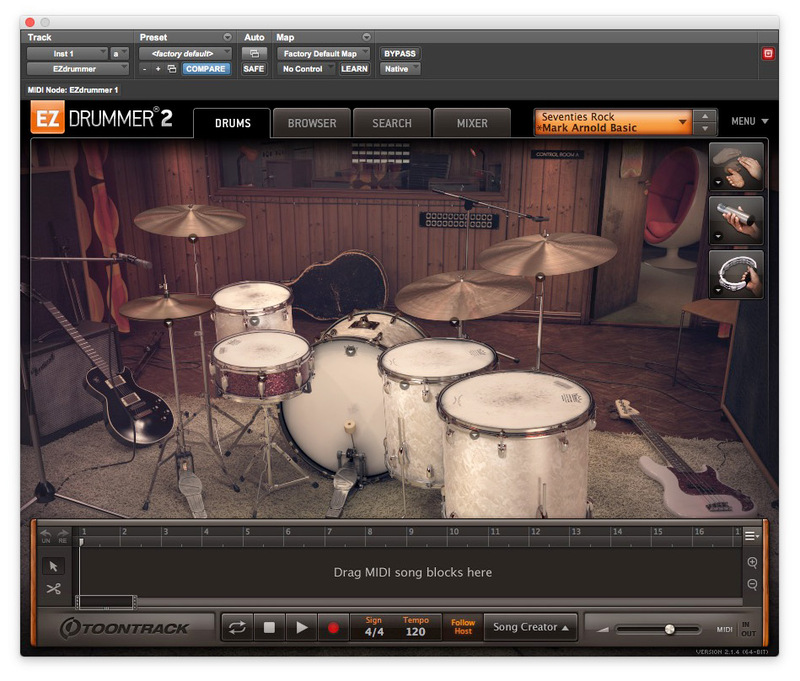 Watch our video review of EZX Country Drums by Toontrack. Visit the Toontrack website to purchase EZX Traditional Country. For years I have longed for a John Bonham style drum VI. Many developers have tried in the past but I feel all of them have missed by a traditional country mile. This though, The EZX Seventies Rock pack fills that void I have been missing in my drum VI arsenal. All the kits in this package sound enormous and when they sound as though they can't get any bigger you only need to play around with the camber and reverb faders in the mixer to make them sound larger than life itself. The feature that I love in this package is the COMP fader within the mixer. The COMP is parallel compression, it blends everything together in a really authentic retro-rock way. Visit the Toontrack website to purchase Seventies Rock EZX. This EZX package is very different from the other two in this list. The drum hits in Traditional Drums and Seventies Rock include microphone bleed - such as a small amount of kick spill coming through the snare microphone and so on. Dream Pop EZX doesn't try to mimic drum recording realism, instead Dream Pop EZX is more of a drum sampler containing many interesting hits than a drum kit sample library. I reach for the Dream Pop EZX when I'm working on more contemporary productions as in those situations I need creative sounds that can inspire my imagination. Watch our video review of EZX Dream Pop by Toontrack. Visit the Toontrack website to purchase Dream Pop EZX.